Something tells me I will be in the minority with this one, but Sam and Max Episode 4 is perhaps the weakest entry yet (or close behind the first one). This seems odd at first, because this time Telltale worked on many of the issues that fans (and reviewers like myself) brought up with the last few episodes, namely length and difficulty. I appreciate and respect this, however their solutions to the problems do more harm than good, while the formerly sound humor of past episodes gets less attention and falls flat. I started playing these episodes with excitement and praise. Now I’m starting to get genuinely worried. The previous three episodes were indeed easy to complete and on the short side time wise. This never really bothered me because the settings were fun, the scripts sharp, and the puzzles weren’t damningly hard. I never expected a long quest or deep gameplay from Sam and Max, just a lighthearted adventure with some humor above the grade-school level of most games. This is what I got, and it was quite good. But as expected, our friends in the community, led by their fearless leader, constantly demanded more bang for their mere ten bucks (may we offer some sound advice for the future?). And so Telltale have created an episode filled with stopgaps and contradictory choices in order give them what they want. 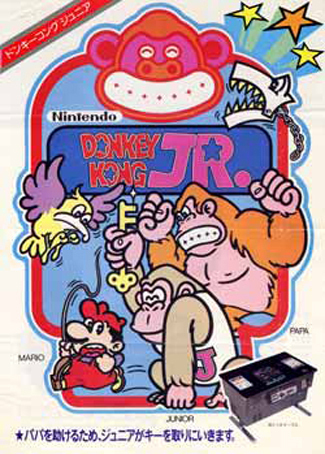 The first three episodes followed a fairly strict pattern; a few opening puzzles, then three major puzzles of a similar theme, culminating in a final boss puzzle. Ep. 4 deviates from the formula – defeating the boss requires solving a multitude of subsequent puzzles that almost total the rest of the game in length. This in and of itself isn’t a problem, since the extra brain teasers aren’t all recycled. What makes it hard to swallow is the excessive amounts of backtracking that it entails. Previous episodes had you go back to your home street twice, maybe thrice on a good play. That number is about doubled in Episode 4, and if you ever get stuck or confused the number gets higher. By the end of the game, you’ll find yourself walking from the bowel’s of the White House to your car, then across the street to Bosco’s, then back to the car, and back to the inside of the White House. It might add only a few minutes to actual game time, but it adds heaps to my impatience. Of course this wouldn’t have been a problem if critics didn’t also complain about not spending enough time in new locations. There’s also the simple problem that this is the fourth episode wherein our heroes have to trick Sybil or buy something from Bosco in order to solve a puzzle. I enjoy these characters, but they highlight an interesting problem with episodic design; we should expect the same characters and settings, but we may also have to expect the same gags. Puzzle difficulty is a tricky subject. They are much harder overall than in the past, but it’s tough for me to say whether they’re challenging in a good way. The essential thing to notice is that this episode is less about finding an item and figuring out where it is used, but instead about knowing what you need and then having to go out and find it. I find the latter approach is more frustrating at this point, because Telltale has recycled so much content that there are certain things in each area I just don’t bother with. This wasn’t a problem in the past (which is why I didn’t slam them for it), but in this episode some of those areas are hiding the things you need. Now I won’t play another episode without checking every nook and cranny in case there’s something I’m missing. I thought that Sam and Max was saving us from such silliness, but that’s no longer the case now that the Consumer Reports gamers have gotten their way. On the other hand, some of the puzzles that gave me the most trouble weren’t entirely unfair. Like a similar one in Ep. 2, they involved going to an older area that had a logical purpose for the given situation. While tricky, they weren’t impossible, though one in particular involved paying very close attention to what it was showing you, for the solution involved a visual clue that you wouldn’t expect to be of importance. From the adventure gamer’s standpoint the progression found in Ep. 4 can be nothing but a good thing. Yet I’m afraid of the series delving into Myst levels of trickery. I’m a big fan of logic, but I don’t want puzzles that hang on the importance of clues that are too subtle for their own good. Let’s leave the difficulty range at this level and no harder. Most disappointing at all is the humor and story, which fails to achieve the same level of intelligence that past episodes displayed, save for a few choice moments. With the subtitle “Abe Lincoln Must Die”, you can expect that the topic of choice this time around is the government. As we all know, politics if a very tricky minefield to cross when it comes to comedy. Telltale manages to navigate it, but only because the game takes a very safe route. It does a good job of balancing its jokes to hit every party, but it rarely does anything we haven’t seen before. I’m sure a lot of people will applaud them for catering to older gamer by using jokes from the Reagan/Bush/Clinton eras, but I don’t see the point in praising a script that uses jokes pulled from 25 years of political cartoons and Saturday Night Live skits. If they couldn’t even squeeze in Michael Dukakis, just how impressed should I be? I don’t know what this all means, but I’m sure alcohol was involved. Finally, as in the past, Abe Lincoln Must Die ends with our heroes foiling a bigger, more menacing foe, only to find out that foe is working for someone else. Its a fine way to keep the whole season on the same continuity, but by now its getting a little thin. Why not introduce nothing at the end and have the next villain be a complete surprise? 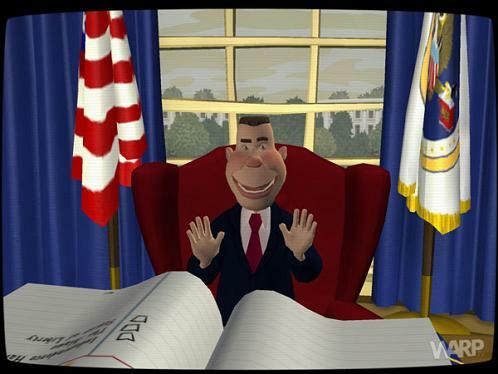 And so Episode 4 poses another serious question; what exactly should we expect from Sam and Max? At this point it seems that great humor and solid adventure gameplay are mutually exclusive. 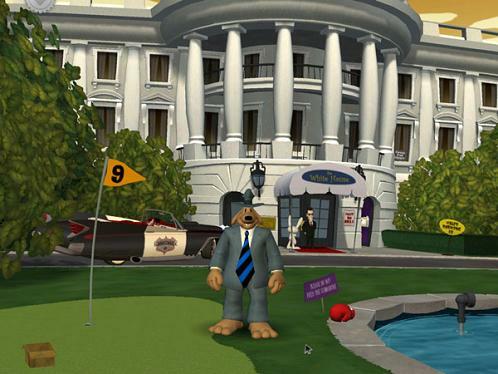 While a strong argument can be made for the difficulty concerns, I feel that in the end Sam and Max is nothing without its unique style of humor. And still more people will bring up that in the old Lucasarts days they got the best of both worlds. I know I could live with comedy over content if I have to, but until the rest of gamers realize that a $9 episode does not have to have 10+ hours of gameplay, I’m not sure what we’ll get, but I don’t think I’ll like it. Season 1 is almost complete. Please let it finish off with a bang and not a whimper. Putting aside for the moment my frustration that I don’t have episode 4 yet, this review worries me, because the humor is honestly why I play sam and max. Episode 3 was honestly the funniest game I’ve played since Psychonauts, and while I can see it eventually getting old, the gags involving Sybil and Bosco honestly wouldn’t have worked well if I didn’t know them from the first couple episodes. As garfield demonstrated with the pie-in-the-face gag one fateful saturday morning during my childhood, repitition is funny. well sybil and bosco have some good laughs thanks to better writing in their segments. The crud is mostly at the white house. I can only wonder how much longer they can do it though; its not the repetition that’s bothersome as much as their two gags (careers and secret identities) can only go so far. Interesting review. All in all I share some of your viewpoints, and I am finding this episode more difficult than the last. But it is more in a frustrating way (ie I cannot for the life of me think of a way to solve the puzzle I am stuck on, and haven’t seen anything that would seem to solve it anywhere). I am finding it quite boring now that we get to the 4th episode to walk around looking at the same objects and getting the same standard replies that have been used in the 3 previous episodes… But I still find the storyline interesting so far, and think that TellTale are doing an amazing job producing a game at this price! Okay, I’ve now finished episode 4, and while it wasn’t as bad as I had feared, it left me with something of a "blah" feeling. Part of this is probably because I’m from DC. For readers from elsewhere, politics is our local sport. We know our players, our teams, and our rules, and the whole segment on special elections after the president died just fell flat for me. Imagine for a moment a game based around a football team, where at the end of the fourth quarter one team is down by 2, tries for a touchdown, and fails. But then it turns out that because there are still 2 innings left, play continues after the game clock has run down to 0, and therefore they are able to pull off a win. It’s not that a game like sam and max has to be realistic, but at a certain point (which varies for everyone), you’re left with a sensation of having tripped over that last joke. Similarly, the joke writing didn’t seem quite up to par. It’s still funnier than most games out there, but episode 3 had me consistantly laughing out loud, whereas the political humor in this game seemed to be really oversimplified and not very creative. Once again, DC may have biased me here, because we really do have most of the country beat when it comes to cynical commentary on politics. Finally, there were some logic issues, primarily with the listening bug. Twice during the game I used it to record a statement which other dialog had led me to believe would be exactly what was needed, and both times it didn’t work. Instead, some other (somewhat arbitrary) action had to be taken. It’s hardly a game-killer, but it was frustrating. I still enjoyed myself overall, but it was definitely a slump in the series. And Christian, I do see what you mean about the Sybil/Bosco jokes starting to wear. Bosco just wasn’t very funny this time around.